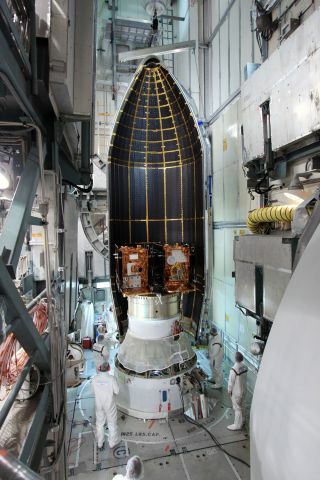 The payload fairing is added to the GRAIL booster. NASA is set to launch a new robotic mission to the moon today (Sept. 8) and students are invited to ride along ... sort of. The space agency's Grail moon probe mission, made up of twin spacecraft called Grail-A and Grail-B, are carrying special cameras that will photograph specific areas of the lunar surface, as requested by middle school students and educators across the country. The student camera project, named Grail MoonKAM, is led by former NASA astronaut Sally Ride, America's first woman in space and Sally Ride Science, a science education company aimed at promoting student interest in science math and technology. The program is also a collaborative effort involving undergraduate students at the University of California San Diego. "Using the context of lunar exploration, using gravitational experiments, MoonKAM will serve as eyes on the moon for students," Leesa Hubbard, a teacher-in-residence at Sally Ride Science in San Diego, said in a news briefing on Wednesday (Sept. 7). On the MoonKam website, tens of thousands of middle school students will be able to select areas on the lunar surface and submit image requests to the so-called MoonKAM Mission Operations Center, which will be monitored by students at the University of California San Diego. The requested images will be beamed back by the Grail probes and posted on the MoonKAM website, where students will be able to examine the different surface features in their selected regions. The MoonKAM project is aimed at raising public awareness about lunar science, and specifically aims to inspire the nation's youth to study science, math and engineering, she said. "You never know what the wow factor is going to be for a student, you never know what an image will evoke," Hubbard said. "It's difficult for us to measure the impact of inspiration, but NASA does have that inspiration factor and our students certainly need that, and it's certainly something they can get excited about." The roughly 80-day MoonKAM project will operate over the course of Grail's three-month mission. And while the mission's science objectives take priority, Grail's program scientists are expecting to be able to provide valuable images for public outreach and education, said Maria Zuber, Grail principal investigator at MIT. NASA's $496 million Grail spacecraft will study the moon's composition in detail and the two spacecraft's observations will construct precise maps of the lunar gravity field. These observations will be used to help researchers paint a clearer picture of the moon's formation and its evolution.